Grootbos Private Nature Reserve – the luxury lodge tucked between mountains, forest and sea just outside Gansbaai – was announced as the Overall Winner of the African Responsible Tourism Awards 2019. The announcement was made at a ceremony sponsored by Wesgro and held this afternoon at WTM Africa in Cape Town. Grootbos was selected to receive this acclaimed prize from among a field of strong contenders, including some of South Africa’s tourism icons. “As the African Responsible Tourism Awards concludes its 5th year, we are pleased that it has grown in stature year-on-year. The judges are now callibrating the Gold and Silver awards against the WTM World Responsible Tourism Awards’ benchmarks. The World Awards have been running since 2004, and the WTM World Awards family now has regional awards in Africa, India and Latin America. The African Responsible Tourism Awards recognises leaders in responsible tourism in the most culturally diverse continent and in the city where in 2002 responsible tourism was defined in the Cape Town Declaration on Responsible Tourism in Destinations. The full list of this year’s winners is included below. You can also visit the Awards’ website, www.africanresponsibletourismawards.com to read their stories and to watch videos from the Overall Winner. It is rare for a business based on a floral attraction to feature in tourism awards. Grootbos emerged as the overall winner because the judges recognised that it could have won in several categories. Grootbos has won Gold this year in recognition of the substantial growth in its conservation impacts. But there is much more to Grootbos. They deliver across the economic, social and environmental agendas. The Football Foundation provides positive role models and a safe space for local youth. It reaches 9000 youth each year and provides daily sports coaching in hockey, athletics, soccer and netball and canoeing as well as female empowerment, environmental education, food for sport, grassroots soccer, HIV/Aids and water safety programmes. Green Futures is a vocational training college. 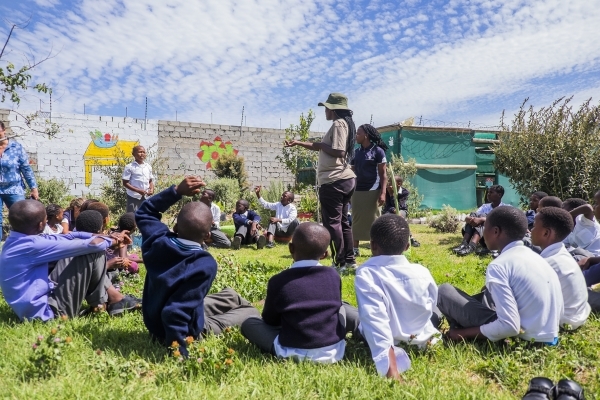 Siyakhula – the social enterprise arm of the Grootbos Foundation – runs an organic farm, a careers and entrepreneurship programme and support for Early Childhood Development Centres. Grootbos is a remarkable example of how much can be achieved through a committed approach to responsible tourism. Mdumbi Green Fair Festival in the Mankosi area in rural Eastern Cape proves that even small rural events can deliver ample environmental, social and economic shared value to the local area. The detailed quantification of impacts and achievements across economic, social and environmental pillars, for a festival of this nature is remarkable. The festival’s focus is the strengthening local citizenry’s ability to play a strong and vibrant role in the socio-economic transformation in their area. The organisers crowd in professionals – chefs, security specialists, musicians and make-up artists – to build skills and knowledge amongst local people. All festival revenue flows into the community: a portion directly to local caterers, security force, cleaners and recyclers, grounds team, accommodation providers and artists; and a portion to TransCape NPO for community-focussed work in education, health and small business development. 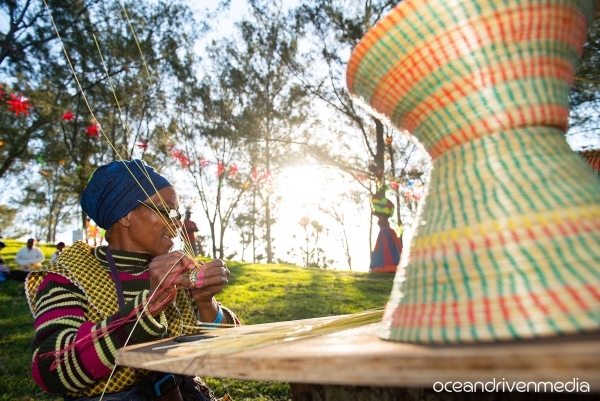 Mdumbi Green Fair Festival lives up to its name through tree-planting, avoiding single-use items in catering, recycling of 95 % of festival waste, solar lighting, upcycled waste material in décor pieces and environmental footprint information for festival goers. An indigenous nursery and educational garden to generate income and for biodiversity education is planned in the long-term. 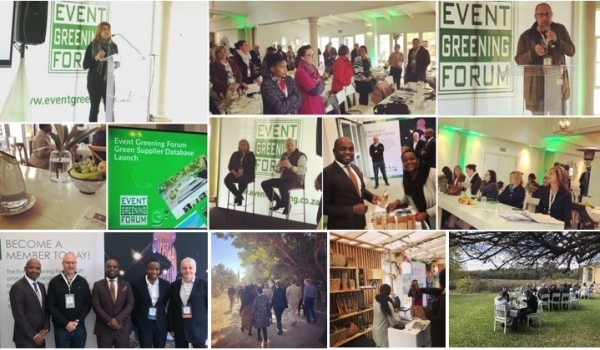 One would expect an event run by South Africa’s Event Greening Forum to tick all the sustainable eventing boxes. From the selection of an accredited Healthy venue with ample natural light to a menu with locally-sourced seasonal ingredients and interactive hands-on activities for 60-odd delegates, this well-conceived event showcased low cost and easy-to-do sustainable event practices. Lanyards were collected for re-use in 2018 and wasteful branded conference bags and hand-outs avoided. African Mama Crafts, a black female-owned local SME business which works with rural cooperatives, was contracted to supply gifts in the Sustainability Village. An Environmental Vision Statement was adopted at the outset and guided the GCIP-SA Annual Awards 2017 organisers and contractors in all aspects of event management and communication. Waste levels were minimized through a paperless registration system, recycling or reuse of stand material and banners, and reuse of packing materials. All lighting and electronic items were either LED or low energy compliant. Community arts organisations were contracted to provide traditional and local gifts for VIP’s and guests using a voucher system. A philosophy of continuous improvement is evident, and an event impact report details performance on water and energy consumption and waste levels over a three-year period and setting out corrective action for 2018. The judges were looking for an event that could demonstrate design and organisational practices that are not only progressive, but also integrate the three core elements of sustainability. The event should its environmental footprint, help to address social or environmental issues in its host destination, and deliver optimal benefit to the local economy. The judges decided to split this category in two according to the size of the event. There are now winners for the best large and small sustainable event. Meetings Africa, the continent’s major tradeshow for the meetings industry with some 300 exhibitors, attracts about 2500 participants. The event is guided by an extensive sustainability plan with quantified targets. Actual performance is meticulously documented in a post-event report and independently verified. These documents cover a sweeping range of actions to reduce the event environmental footprint and increase socio-economic gains for local small businesses. Economic inclusion is a central plank of Meetings Africa. Hosted byers are given vouchers to exchange for locally made gifts from suppliers exhibiting in the Sustainability Village, guaranteeing sales to SMMEs and avoiding wasteful expenditure on unwanted gifts. Black owned tourism SMME’s participate gain exposure to qualified buyers through the Development Zone. Event waste management services and staff uniforms are supplied by female-owned start-up businesses supported and mentored by large exhibition and event infrastructure suppliers. Environmental efforts include waste reduction and recycling, bokashi bins for food waste, upcycled content in décor, renewable energy certificates and carbon offsetting, and donation of carpets to community projects. 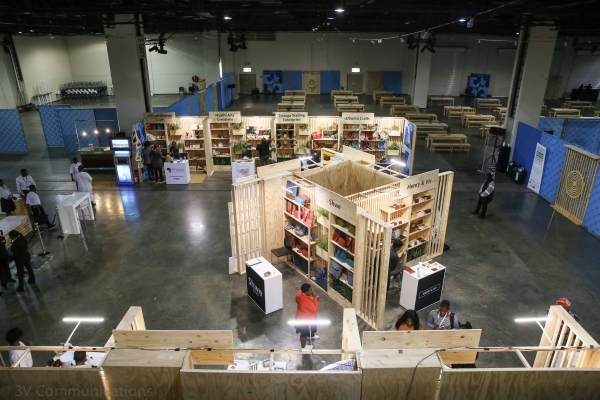 Exhibitor manuals and briefings include information on sustainable exhibition stands, and show communications reinforce the sustainability message. 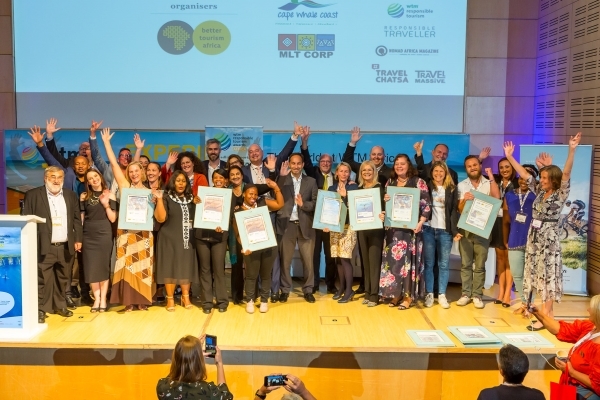 Major contractors sign a Green Pledge, and exhibitors and accommodation suppliers are awarded for responsible practices though a Green Stand Awards and Green Hotel Awards. Meetings Africa not only harvests business meetings worth billions of Rands for Africa, it masterfully delivers across the environmental and social bottom lines. The Cape Town Marathon attracts 23,000 runners from 82 countries and generates more than R200 million for the economy. The RUN4Change Legacy Program with five pillars: Charities, Health, Sustainability, Peace and Development governs the event. A comprehensive range of related actions include: fund-raising for 50 charities, zero waste to landfill through meticulous management of the waste stream, climate neutrality through carbon off-setting with Wonderbag, free development entries for community running clubs and collection of donated running shoes. The judges were impressed the use of Blue Water trailers equipped to supply runners with filtered water-on-tap, backed by a pre-event “carryyourown” awareness campaign. A multi-pronged communication plan focussed on the Run4Change Legacy pillars targets participants, partners, sponsors and communities along the race route. The Western Cape was drought-stricken at the time of the 2017 race – increasing the distance between water stations, management of the number of sachets/per runner and the use of grey water reduced overall water use. Given its location in Table Mountain National Park and the Cape Floristic Region World Heritage Site, responsibly managing water and waste associated with more than 1 million visitors per year in a sensitive biosphere is a top priority for Table Mountain Aerial Cableway Company (TMACC). The business already had a multifaceted suite of measures to reduce waste and manage water consumption in place to support a silver win for Resource Management in the 2015 African Responsible Tourism Awards. These included low-flush toilets, compostable catering supplies that reduce both waste to landfill and water use, beverage dispensers instead of glass bottles or tins, recycling information and guidance for visitors, and responsible management of hazardous waste. Additional measures since 2015 range from an organic waste management system to waterless urinals and the introduction of hand-sanitiser as taps were closed off. Transporting all potable water and food products to the top of the mountain, and solid waste and waste water down by means of the cable car, is worthy of recognition. Reductions in per capita consumption of water or volumes of waste generated are typically most marked soon after the introduction of management measures. Given that most of the water and waste management innovations were introduced before 2015, the judges did not expect to see drastic reductions in per capita figures in recent years. However, maintaining reduced per person water consumption and waste levels over a five-year period is remarkable. The judges were convinced that enough supplementary work has been done and performance maintained since 2015 to warrant another win. It is rare to find an aquarium that exhibits ONLY species from its own geography and not rely on exotics to attract visitors. 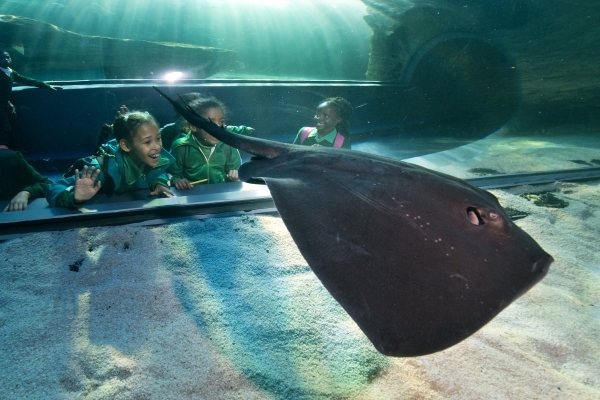 The Two Oceans Aquarium showcases the diversity of the oceans off southern Africa and raises awareness of threats to ocean life and responsible use of marine resources. Plastic in the ocean and sustainable seafood are key topics. Conservation and sustainability-oriented messaging is included in exhibit signage, daily talks, media platforms, and speaker evenings. As could be expected, the conservation and research of marine and coastal species is a major focus. A sea turtle rescue, rehabilitation and release programme, seal monitoring and disentanglement project in the Waterfront, and support for SANCCOB and Shark Spotters though donations of a portion of visitor fees, are but some of the related programmes. An environmental management system directs the operation of the attraction that draws 500 000 visitors per year. Performance against targets for water and energy consumption, waste production and carbon emissions are monitored and documented in annual sustainability reports. Performance is independently audited annually. Educational programmes about marine life, coastal habitats and sustainable living are not limited to the Aquarium building – three outreach programmes reach more than 35,000 children, mainly from disadvantaged areas, per year. Various environmental campaigns and activations and campaigns increase conservation awareness amongst the general public. These include beach clean-ups, Rethink the Bag and Home to Ocean campaign and participation in Plastic Free July. Panthera Africa Big Cat Sanctuary provides sanctuary to rescued big cats and educates the public about the reality that animals in captivity face. Educational visits, volunteer and ambassador program, school outreach program, presentations to tourism sector stakeholders and social media are used to raise awareness and support ethical decisions about animal interactions. The Education Centre under development will add an additional dimension to the visitor experience that may well warrant an award once fully established. The judges want to recognise the contribution which !Khwa ttu has made to empowering and supporting the San across southern Africa through heritage and education initiatives. The “museum” is located in Darling just outside Cape Town in the Western Cape. Established in 2018, this indigenous heritage centre has already attracted around 20 000 visitors. The museum represents a real milestone for the San. It is the only extensive heritage centre for the San and it was entirely co-curated. The judges recognise that for the San across southern Africa, as well as local people who are of San ancestry, having ‘their own museum’ brings them extraordinary pride. At the same time, many San have a very limited idea of the other San and they take delight in discovering their similarities and differences. Resident San elders and guides introduce performances and experiences. !Khwa ttu plays an important role in ensuring the maintenance and development of San knowledge, culture and traditions into the modern world. Today’s San are among the few remaining descendants of hunter-gatherers who once lived throughout the world and they have knowledge valuable to us today in understanding our past and our future. Isandlwana is famous for the battle of 22 January 1879 when a Zulu impi army defeated a British regiment. The site attracts large numbers of domestic and international visitors. The judges recognise the success of Africa !Ignite in making tourism more inclusive and benefiting adjacent, previously largely excluded communities by successfully developed a range of activities, cultural experiences, and traditional handicrafts. In 2018 they attracted 12 000 visitors to the Wirenest Craft Cooperative in Nondweni Village, the site where a French Prince Imperial was killed during the Anglo-Zulu War. There visitors can either watch women at work hand-embroidering on recycled mealie bags or learn a new skill and create a small embroidery piece which they can take away. With support from the Dutch government-funded CBI ‘promotion of exports from developing countries’ programme, Africa !Ignite has developed a range of décor and accessory products that complement the initial cushion covers which featured the hand-embroidery on recycled polypropylene of the Wirenest Cooperative. There was a strong field of contenders in this category including many who had won previously in this family of Awards, within the Africa Responsible Tourism Awards or the World Responsible Tourism Awards. Previous winners in either the Africa or the World Awards need to demonstrate that they have significant new achievements or evidence of impact to report. Grootbos was recognised in 2017 in the World Awards in the accommodation category and in 2007 for conservation. Grootbos regularly wins awards but the judges wanted to acknowledge the progress which has been made in recent years with the significant extension of their conservation work. Grootbos has made substantial progress in realising their ambition to achieve a landscape-level conservation project and to create an ecological corridor to conserve fynbos. Six species new to science have been identified, 9500 hectares has now been cleared of alien species and a further 653 hectares has been included in the conservation area. Grootbos now employs six conservation specialists which includes a botanist, entomologist, alien clearing specialist, mammalian fauna specialist and motion camera monitoring specialist. There are 36 motion sensor cameras in service enabling Grootbos to identify the fauna species in the flora reserve and to extend their conservation work. 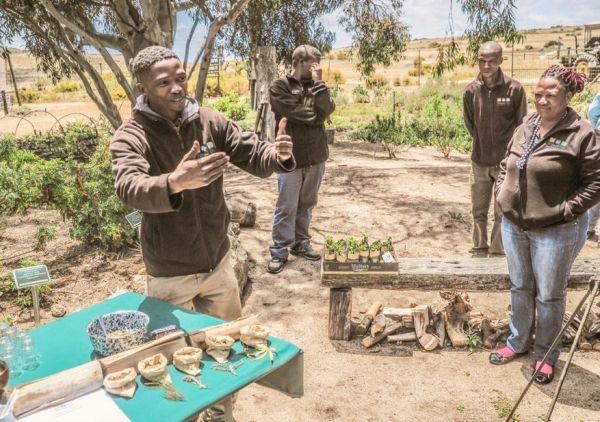 The Groootbos Private Nature Reserve supports 20% of the direct spend on conservation through a ZAR75 conservation levy on the lodge and 25% is raised by the Groootbos Foundation selling products and services at above-market prices to the Grootbos Lodges. Great Plains Conservation was recognised for its conservation work in the World Awards in 2009. The judges were delighted to see that Great Plains has won the rights to trade and offer safari experiences in the private Sapi Reserve in Zimbabwe. A wildlife protection and monitoring anti-poaching unit has begun work and wire snares are being removed. The judges recognise that this is an important new development and expect it to win an award in the near future as the new photographic safari business develops replacing the previous hunting concession. Dorobo operates small light-weight mobile camps and safari vehicles in northern Tanzania. Its greatest achievement has been promoting cultural dignity and supporting land security for vulnerable communities. Dorobo has assisted community partners to secure 23,500 hectares of their land for traditional hunting and gathering in the Yaeda Valley. Along the Maasai Steppe, over 27,000 hectares of grassland is being sustainably managed by the local communities for livestock and wildlife grazing. With legal certificates to the land and transparent tourism agreements, communities earn revenue for protecting this vital area against agricultural encroachment, permanent settlement, and charcoal production. Fourteen tourism agreements with local villages benefit in the order of 55,000 local people. The business works directly with local village governments who represent the greater community. Contracts span five years and follow local laws and customs. A payment structure and a guaranteed annual income are agreed upon, enabling communities to budget efficiently each year. Communities members have access to periodic reports of revenue from tourism that has been disbursed and can hold local leadership accountable for the management and use thereof. Further, in 2018, Dorobo Safaris employed community members for 1430 days of work hosting clients in community areas – this was in addition to locals employed in full-time positions. In 2009 the Namibian Ministry of Environment and Tourism translocated six desert adapted black rhino to the Huab Conservancy with the intention of catalysing tourism in the area and generating much needed revenue for the local people. Ultimate Safaris signed a joint venture agreement with the Conservancy in 2016, catalysing extensive community benefits. Conservation and tourism-based jobs have become available with two full time rhino tracking teams now employed, dramatically increasing the number of community game guards, as well as jobs for camp staff and various contract workers for ancillary jobs. A sustainable fire wood harvesting project and small-scale vegetable gardens and craft sales generates income for households. Further, the conservancy receives revenue from a land lease, bed night fees, rhino tracking fee, salaries, wood supply, part time labour. Tourism activities have already generated ZAR 650,000 in conservation investment into the area and generate ZAR 500,000 annually for the Conservancy. All benefits are channelled through the Conservancy office, and the Conservancy Committee acts as the governing body for the area and the members that inhabit it. The judges felt that Anvil Bay in Mozambique was one to watch because these three local communities have 40 percent ownership in this small coastal lodge in the Maputo Special Reserve – Mabuluco, Vakuza and Tsolombane. The judges were impressed by the income from sourcing of local products and services, local employment and a bed levy earned by these communities in the two years the lodge has been in operating. There is clear evidence of a true partnership focussed on economic inclusion and empowerment. The judges believe that a win in future years is possible should Anvil Bay continue on this trajectory. The Two Oceans Aquarium does not over-state its contribution to the Sustainable Development Goals. The identified SDGs – Quality Education, Responsible Consumption and Life Below Water – are directly related the organisation’s core business and sphere of influence. There is clear, credible evidence of the alignment between the company’s efforts and the relevant SDGs and specific targets. Actual performance is either transparently reported in an annual sustainability report, or where data against a target is not available, a commitment to the necessary research is in place. By identifying only relevant SDGs and detailing how the business is working to contribute to them, the Two Oceans Aquarium sets a pragmatic and replicable approach to reporting against the SDGs.